"We were conscious at the time a modern home can be cold and unwelcoming. The longer we live here the more we think it is a fantastic house to live in." "We are delighted with how Caroline has achieved the goals of getting views and sun to all living and bedrooms." 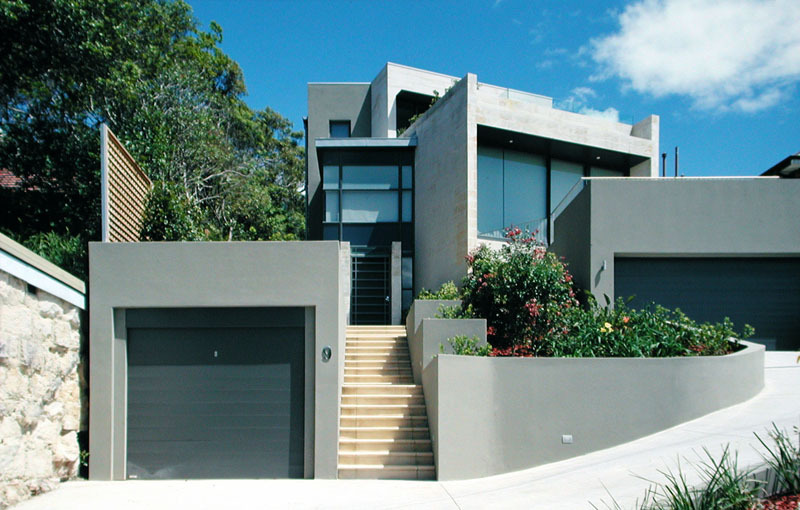 Located in a seaside suburb of Sydney, a moderately sloping site rises from the road up to a beautiful bushland setting amongst rocky outcrops. The site runs along an east-west axis with great views over Manly to the east. The existing redbrick house sat poorly on the site and did not make the most of the micro-climate, and was demolished to make way for the new house. The brief was to design a contemporary light-filled family home to engage with the harbour outlook from every room and take advantage of the great orientation. The house had to be flexible to meet the needs of the family as it changes and grows, and to accommodate occasional visiting relatives from interstate. The response was to create a building form that sweeps around from the front rectilinear volumes aligned to the street, stepping over and around each other up the slope to the landscape at the rear. The form was generated by the need for all living rooms to have solar access, make the most of the eastern views, and to channel cool summer breezes through the house. 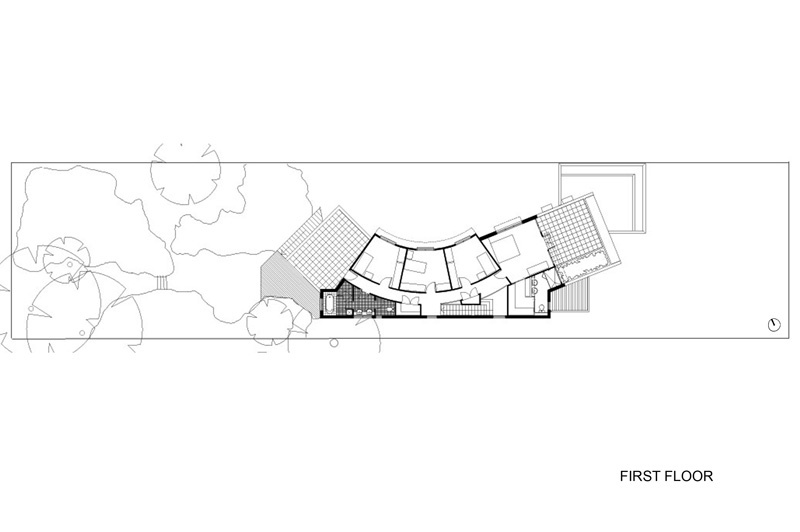 A spine to the south contains the service zones and acts as a supportive spine to the main form of the house. The living spaces are zoned for both thermal and acoustic purposes. The formal living area is located at the front of the house making the most of the views, with the informal living areas located centrally in the site, opening directly onto a courtyard that fills the void created by the curved form of the house. Landscaping is integral to the house as it connects the built form to the site. The rear garden incorporates native plants with a natural sandstone outcrop, and a combination of curved walls and rectilinear forms mediate between the geometry of the house and the external environment. This building shows how environmental factors, when positively embraced, can have an inspiring and beneficial impact on design. The house demonstrates how comfortable environmental conditions can be created within a beautiful envelope without resorting to mechanical means alone for cooling and heating. This is intended to give the inhabitants great pleasure as well as ensuring a long lifespan for the building. Good thermal performance to result in minimal heating and no cooling. Heating system - gas central heating. 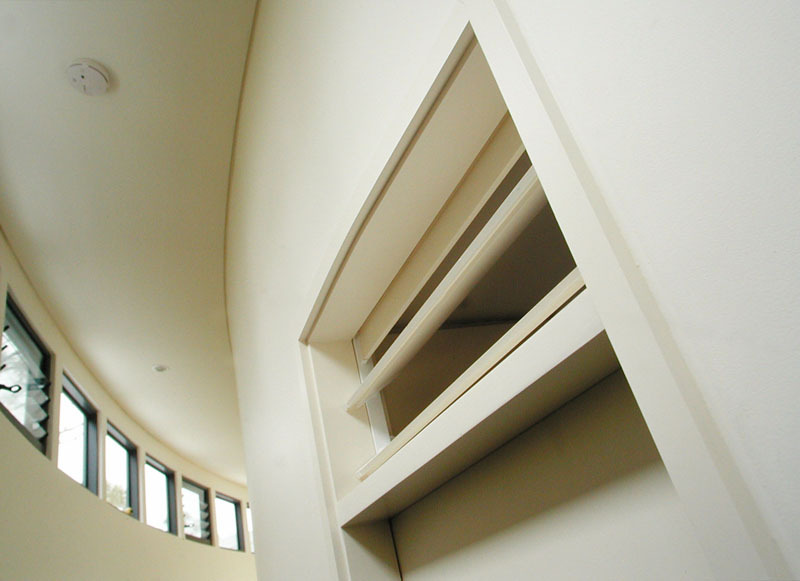 Well designed natural ventilation throughout house, including details for bedrooms. Water saving fixtures and appliances. Timber from sustainably managed forests for new floor boards and decking. Built-on area kept to a minimum.